"Cervantes" redirects here. For other uses, see Cervantes (disambiguation). This name uses Spanish naming customs: the first or paternal family name is de Cervantes and the second or maternal family name is Saavedra. Miguel de Cervantes Saavedra[b] (/sərˈvæntiːz/; US: /sərˈvɑːnteɪz/; Spanish: [miˈɣel de seɾˈβantes saaˈβeðɾa]; 29 September 1547 (assumed) – 22 April 1616 NS) was a Spanish writer who is widely regarded as the greatest writer in the Spanish language and one of the world's preeminent novelists. His novel Don Quixote has been translated into over 140 languages and dialects; it is, after the Bible, the most-translated book in the world. Don Quixote, a classic of Western literature, is sometimes considered both the first modern novel and the best work of fiction ever written. 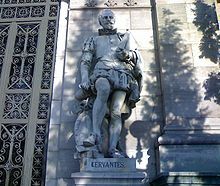 Cervantes' influence on the Spanish language has been so great that the language is often called la lengua de Cervantes ("the language of Cervantes"). He has also been dubbed El príncipe de los ingenios ("The Prince of Wits"). In 1569, in forced exile from Castile, Cervantes moved to Rome, where he worked as chamber assistant of a cardinal. Then he enlisted as a soldier in a Spanish Navy infantry regiment and continued his military life until 1575, when he was captured by Barbary pirates. After five years of captivity, he was released on payment of a ransom by his parents and the Trinitarians, a Catholic religious order, and he returned to his family in Madrid. In 1585, Cervantes published La Galatea, a pastoral novel. He worked as a purchasing agent for the Spanish Armada and later as a tax collector for the government. In 1597, discrepancies in his accounts for three years previous landed him in the Crown Jail of Seville. In 1605, Cervantes was in Valladolid when the immediate success of the first part of his Don Quixote, published in Madrid, signalled his return to the literary world. In 1607, he settled in Madrid, where he lived and worked until his death. During the last nine years of his life, Cervantes solidified his reputation as a writer, publishing Novelas ejemplares (Exemplary Novels) in 1613, Viaje del Parnaso (Journey to Parnassus) in 1614, and Ocho comedias y ocho entremeses and the second part of Don Quixote in 1615. His last work, Los trabajos de Persiles y Sigismunda (The Travails of Persiles and Sigismunda), was published posthumously in 1617. The Church of Santa María la Mayor where Cervantes was baptized in Alcalá de Henares. The square in front of it is now called Plaza Cervantes. On Sunday, the ninth day of the month of October, the year of our Lord one thousand five hundred forty and seven, Miguel, son of Rodrigo Cervantes and his wife Leonor, was baptised; his godfathers were Juan Pardo; he was baptised by the Reverend Bachelor Bartolomé Serrano, Priest of Our Lady. Witnesses, Baltasar Vázquez, Sexton, and I, who baptised him and signed this in my name. Bachelor Serrano. His father, Rodrigo, was a barber-surgeon of Galician extraction from Córdoba, who set bones, performed blood-lettings, and attended to "lesser medical needs"; at that time, it was common for barbers to do surgery as well. His paternal grandfather, Juan de Cervantes, was an influential lawyer who held several administrative positions. His uncle was mayor of Cabra for many years. His mother, Leonor de Cortinas, was a native of Arganda del Rey and the third daughter of a nobleman, who lost his fortune and had to sell his daughter into matrimony in 1543. This led to a very awkward marriage and several affairs by Rodrigo. Leonor died on 19 October 1593. Miguel at birth was not surnamed Cervantes Saavedra. He adopted the "Saavedra" name as an adult. Little is known of Cervantes' early years. It seems he spent much of his childhood moving from town to town with his family, eventually enrolling in The Imperial School, a Jesuit educational establishment for boys in Madrid. [not in citation given] Court records show a very poor household. While it has been speculated that he studied at the University of Salamanca, there is no evidence supporting it. Based on the high praise of the Jesuits in the Dialogue of the Dogs, there has been speculation that Cervantes also studied with them, but again there is no evidence. His siblings were Andrés (1543), Andrea (1544), Luisa (1546), Rodrigo (1550), Magdalena (1554) and Juan – the latter known solely because he is mentioned in his father's will. The reasons that forced Cervantes to leave Spain remain uncertain. Possible reasons include that he was a "student" of the same name, a "sword-wielding fugitive from justice", or fleeing from a royal warrant of arrest, for having wounded a certain Antonio de Sigura in a duel. Like many young Spanish men who wanted to further their careers, Cervantes left for Italy. In Rome, he focused his attention on Renaissance art, architecture, and poetry – knowledge of Italian literature is discernible in his work. He found "a powerful impetus to revive the contemporary world in light of its accomplishments". Thus, Cervantes' stay in Italy, as revealed in his later works, might be in part a desire for a return to an earlier period of the Renaissance. Though taken with fever, Cervantes refused to stay below. He demanded to take part in the battle, saying he would rather die for his God and king than keep under cover. He fought, and received three gunshot wounds—two in the chest and one that rendered his left arm useless. In Journey to Parnassus he said that he "...had lost the movement of the left hand for the glory of the right," (referring to the success of his writing Don Quixote). Cervantes recounted his conduct in the battle with pride. He believed he had taken part in an event that shaped the course of European history. On 6 or 7 September 1575, Cervantes set sail on the galley Sol from Naples to Barcelona, with letters of commendation to the king from the Duke of Sessa. On the morning of 26 September, as the Sol approached the Catalan coast, it was attacked by Ottoman pirates and he was taken to Algiers, which had become one of the main and most cosmopolitan cities of the Ottoman Empire, and was kept there in captivity between the years of 1575 and 1580. After five years as a slave in Algiers, and four unsuccessful escape attempts, he was ransomed by his parents and the Trinitarians and returned to his family in Madrid. 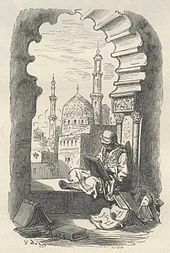 Not surprisingly, this traumatic period of Cervantes' life supplied subject matter for several of his literary works, notably the Captive's tale in Don Quixote and the two plays set in Algiers – El trato de Argel (Life in Algiers) and Los baños de Argel (The Dungeons of Algiers) – as well as episodes in a number of other writings, although never in straight autobiographical form. "The pen is the language of the soul; as the concepts that in it are generated, such will be its writings." – Miguel de Cervantes at the Biblioteca Nacional de España (National Library of Spain). Cervantes led a middle-class life after his return to Spain. Like almost all authors of his day, he was unable to support himself through his writings. Two periods of his life that are very well documented are his years of work in Andalucía as a purchasing agent for the Spanish navy (i.e., the King). This led to his imprisonment for a few months in Seville after a banker with whom he had deposited Crown funds went bankrupt. (Since Cervantes says that Don Quixote was "engendered" in a prison, that is presumably a reference to this episode.) He also worked as a tax collector, travelling from town to town collecting back taxes due the crown. He applied unsuccessfully for "one of four vacant positions in the New World", including as an accountant for the port of Cartagena and as governor of La Paz. At the time he was living in Valladolid, then briefly the capital (1601–1606), and finishing Don Quixote Part One, he was presumably working in the banking industry, or a related occupation where his accounting skills could be put to use. He was turned down for a position as secretary to the Count of Lemos, although he did receive some type of pension from him, which permitted him to write full-time during his final years (about 1610 to 1616). His last known written words – the dedication to Los trabajos de Persiles y Sigismunda – were written, he tells us, after having received Extreme Unction. He died in 1616 of type II diabetes. In Esquivias, Toledo, on 12 December 1584, he married the much younger Catalina de Salazar y Palacios (born Esquivias – d. 31 October 1626), daughter of Fernando de Salazar y Vozmediano and Catalina de Palacios. Her uncle Alonso de Quesada y Salazar is said to have inspired the character of Don Quixote. Over the next 20 years, Cervantes led a nomadic existence, working as a purchasing agent for the Spanish Armada and as a tax collector. He suffered bankruptcy and was imprisoned at least twice (1597 and 1602) for irregularities in his accounts. Between 1596 and 1600, he lived primarily in Seville. In 1606, Cervantes settled in Madrid, where he remained for the rest of his life. In 1585 Cervantes published his first major work, La Galatea, a pastoral romance, at the same time that some of his plays, now lost – except for El trato de Argel (where he dealt with the life of Christian slaves in Algiers) and El cerco de Numancia – were playing on the stages of Madrid. La Galatea received little contemporary notice; and Cervantes never wrote the continuation for it, which he repeatedly promised to do. Cervantes next turned his attention to drama, hoping to derive an income from that source, but his plays failed. Aside from his plays, his most ambitious work in verse was Viage del Parnaso (1614) – an allegory that consisted largely of a tedious but good-natured review of contemporary poets. Cervantes himself realized that he was deficient in poetic talent. If a remark Cervantes makes in the prologue of Don Quixote is taken literally, the idea of the work (though hardly the writing of its first part, as some have said) occurred to him while in jail. Cervantes' wanted to give a picture of real life and manners, and to express himself in clear language. The intrusion of everyday speech into a literary context was acclaimed by the reading public. The author stayed poor until January 1605, when the first part of Don Quixote appeared. The popularity of Don Quixote led to the publication of an unauthorized continuation of it by an unknown writer, who masqueraded under the name of Alonso Fernández de Avellaneda. Cervantes produced his own continuation, or Second Part, of Don Quixote, which appeared in 1615. He had promised the publication of a second part in 1613 in the foreword to the Novelas ejemplares (Exemplary Novels), a year before the publication of Avellaneda's book. Don Quixote has been regarded chiefly as a novel of purpose. It is stated again and again that he wrote it to satirize the chivalric romance and to challenge the popularity of a form of literature that had been a favourite of the general public for more than a century. Don Quixote certainly reveals much narrative power, considerable humour, a mastery of dialogue, and a forceful style. Of the two parts written by Cervantes, perhaps the first is the more popular with the general public – containing the famous episodes of the tilting at windmills, the attack on the flock of sheep, the vigil in the courtyard of the inn, and the episode with the barber and the shaving basin. The second part shows more constructive insight, better delineation of character, improved style, and more realism and probability in its action. Most people agree that it is richer and more profound. In 1613, he published a collection of tales, the Exemplary Novels, some of which he had written earlier. The picaroon strain, already made familiar in Spain through the Picaresque novels of Lazarillo de Tormes and his successors, appears in one or another of them, especially in the Rinconete y Cortadillo. In 1614, he published the Viage del Parnaso and in 1615, the Eight Comedies and Eight New Interludes. At the same time, Cervantes continued working on Los Trabajos de Persiles y Sigismunda, a novel of adventurous travel, completed just before his death, and appearing posthumously in January 1617. Cervantes was buried at the Convent of the Barefoot Trinitarians in Madrid. Cervantes died in Madrid on 22 April 1616 and was buried the next day, 23 April. The cause of his death, according to Antonio López Alonso, a modern physician who has examined the surviving documentation, was type 2 diabetes, a result of a cirrhosis of the liver. This is the best explanation for the intense thirst of which he complained just prior to his death. The cirrhosis is not believed to have been caused by alcoholism; Cervantes was too productive, especially in his final years, to have been an alcoholic. For many years, some references listed 23 April 1616 as the date of his death, and that is still the date when his death is widely commemorated (along with that of William Shakespeare, though the date for Cervantes was according to the Gregorian Calendar while the date for Shakespeare was according to the Julian Calendar, and therefore 10 days later in real time). In accordance with Cervantes' will, he was buried in the neighbouring Convent of the Barefoot Trinitarians, in central Madrid. His bones went missing in 1673 when building work was done at the convent, and were known to have been taken to a different convent and returned later. A project promoted and led by Fernando de Prado began in 2014 to rediscover his remains. In January 2015, it was reported that researchers searching for Cervantes' remains had found part of a casket bearing his initials, MC, at the convent. Francisco Etxeberria, the forensic anthropologist leading the search, said: "Remains of caskets were found, wood, rocks, some bone fragments, and indeed one of the fragments of a board of one of the caskets had the letters 'M.C.' formed in tacks." The first significant search for Cervantes' remains had been launched in May 2014 and had involved the use of infrared cameras, 3D scanners and ground-penetrating radar. The team had identified 33 alcoves where bones could be stored. On 17 March 2015, it was reported that Cervantes' remains had been discovered, along with those of his wife and others, at the Convent of the Barefoot Trinitarians. Through documentary research, archaeologists stated that they had identified the remains as those of Cervantes. Clues from Cervantes' life, such as the loss of the use of his left hand at age 24 and the fact that he had taken at least one bullet to the chest, were hoped to help in the identification. Historian Fernando de Prado had spent more than four years trying to find funding before Madrid City Council had agreed to pay. DNA testing would now be carried out in an attempt to confirm the findings. On 11 June 2015, the remains of Cervantes were given a formal burial at a Madrid convent, containing a monument holding bone fragments that were believed to have been the author's. The city mayor Ana Botella and military attended the event. Cervantes' La Galatea (1585), original title page. El ingenioso hidalgo Don Quixote de la Mancha (1605): First volume of Don Quixote. Segunda Parte del Ingenioso Cavallero [sic] Don Quixote de la Mancha (1615): Second volume of Don Quixote. Los trabajos de Persiles y Sigismunda (1617). Persiles, as it is commonly known, is the best evidence not only of the survival of Byzantine novel themes but also of the survival of forms and ideas of the Spanish novel of the second Renaissance. In this work, published after the author's death, Cervantes relates the ideal love and unbelievable vicissitudes of a couple, who, starting from the Arctic regions, arrive in Rome, where they find a happy ending to their complicated adventure. La Galatea, the pastoral romance, which Cervantes wrote in his youth, is an imitation of the Diana of Jorge de Montemor and bears an even closer resemblance to Gil Polo's continuation of that romance. Next to Don Quixote and the Novelas ejemplares, it is particularly worthy of attention, as it manifests the poetic direction Cervantes moved in at an early period of life. Statuettes of Don Quixote (left) and Sancho Panza (right). 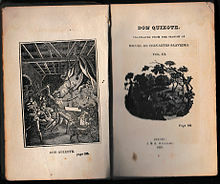 Don Quixote (spelled "Quijote" in modern Spanish) is two separate volumes, now nearly always published as one, that cover the adventures of Don Quixote de la Mancha, a hero who carries his enthusiasm and self-deception to unintentional and comic ends. On one level, Don Quixote works as a satire of the romances of chivalry, which, though still popular in Cervantes' time, had become an object of ridicule among more demanding critics. The choice of a madman as hero also served a critical purpose, for it was "the impression of ill-being or 'in-sanity,' rather than a finding of dementia or psychosis in clinical terms, that defined the madman for Cervantes and his contemporaries." Indeed, the concept of madness was "associated with physical or moral displacement, as may be seen in the literal and figurative sense of the adjectives eccentric, extravagant, deviant, aberrant, etc." The novel allows Cervantes to illuminate various aspects of human nature. Because the novel, particularly the first part, was written in individually published sections, the composition includes several incongruities. Cervantes pointed out some of these errors in the preface to the second part; but he disdained to correct them, because he conceived that they had been too severely condemned by his critics. Cervantes felt a passion for the vivid painting of character. Don Quixote is noble-minded, an enthusiastic admirer of everything good and great, yet having all these fine qualities accidentally blended with a relative kind of madness. He is paired with a character of opposite qualities, Sancho Panza, a man of low self-esteem, who is a compound of grossness and simplicity. Don Quixote is cited as the first classic model of the modern romance or novel, and it has served as the prototype of the comic novel. The humorous situations are mostly burlesque, and it includes satire. 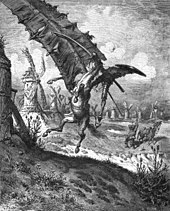 Don Quixote is one of the Encyclopædia Britannica's Great Books of the Western World, while the Russian author Fyodor Dostoyevsky called it "the ultimate and most sublime work of human thinking". 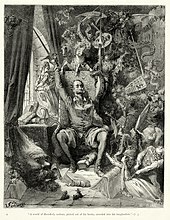 It is in Don Quixote that Cervantes coined the popular phrase "the proof of the pudding is in the eating" (por la muestra se conoce el paño), which still sees heavy use in the shortened form of "the proof is in the pudding", and "who walks much and reads much, knows much and sees much" (quien anda mucho y lee mucho, sabe mucho y ve mucho). Cervantes intended his novels should be to Spanish nearly what the novellas of Boccaccio were to Italians. [d] Some are anecdotes, some are romances in miniature, some are serious, some comic; they are written in a light, smooth, conversational style. Four novelas, though favourites in Cervantes' day, are perhaps of less interest today than the rest: El amante liberal, La señora Cornelia, Las dos doncellas, and La española inglesa. The common theme to these is pairs of lovers (couples) separated by lamentable and complicated events. They are finally reunited to find the happiness they have longed for. The heroines are all beautiful and of perfect behavior. They and their lovers are capable of the highest sacrifices and try to elevate themselves to the ideal of moral and aristocratic distinction that illuminates their lives. In El amante liberal, the beautiful Leonisa and her lover Ricardo are carried off by Turkish pirates. Both fight against serious material and moral dangers. Ricardo conquers all obstacles, returns to his homeland with Leonisa, and is ready to renounce his passion and to hand her over to her former lover in an outburst of generosity; but Leonisa's preference naturally settles on Ricardo in the end. Another group of "exemplary" novels is formed by La fuerza de la sangre, La ilustre fregona, La gitanilla, and El celoso extremeño. The first three offer examples of love and adventure happily resolved, though only on the surface and in purely social terms, for the marriages that occur at their conclusions are morally deficient and repugnant to discerning readers. The last of the four unravels itself tragically. It deals with the aged Felipe Carrizales, who, after travelling widely and becoming rich in America, decides to marry, taking all the precautions necessary to forestall being betrayed, as he had in his youth. He weds a very young girl and isolates her from the world by enclosing her in a well-guarded house with no windows. In spite of these defensive measures, a bold youth succeeds in penetrating the fortress of conjugal honour and one day Carrizales surprises his wife asleep in the arms of this would-be seducer. Carrizales mistakenly assumes that his wife has succumbed to the youth's advances, whereas in fact she did not. Nevertheless, Carrizales pardons those whom he believes are adulterers, recognizing that he is more to blame than they, and dies of sorrow over the grievous error he has committed. Cervantes here calls into question the social ideal of honour to privilege instead free will and the value of the individual. Rinconete y Cortadillo, El casamiento engañoso, El licenciado Vidriera, and the untitled novella known today as El coloquio de los perros, four works of art that are concerned more with the personalities of the characters than with the subject matter, form the final group of stories. The protagonists are, respectively, two young vagabonds, Pedro del Rincón and Diego Cortado, Lieutenant Campuzano, a student – Tomás Rodaja (who goes mad and believes he has become glass, and who makes many remarks on society and customs of the time) and finally two dogs, Cipión and Berganza, whose wandering existence serves as a commentary on the picaresque novel. The two young vagabonds of Rinconete y Cortadillo come by chance to Seville, and also attracted by the riches and disorder that 16th-century commerce with the Americas had brought to that metropolis. There they come into contact with a brotherhood of thieves, the Thieves' Guild, led by Monipodio, whose house is the headquarters of the Sevillian underworld. The solemn ritual of this band of ruffians is all the more comic for being presented in Cervantes' drily humorous style. Cervantes finished the romance of The Labours of Persiles and Sigismunda shortly before his death. The idea of this romance was not new and Cervantes appears to imitate Heliodorus. The work is a romantic description of travels, both by sea and land. Real and fabulous geography and history are mixed together and, in the second half of the romance, the scene is transferred to Spain and Italy. The book ends with a visit to the Pope and the Christian marriage of the two protagonists, whose identity has been concealed. Some of his poems are found in La Galatea. He also wrote Dos Canciones à la Armada Invencible. His best work, however, is found in the sonnets, particularly Al Túmulo del Rey Felipe en Sevilla. Among his most important poems, Canto de Calíope, Epístola a Mateo Vázquez, and the Viaje del Parnaso (Journey to Parnassus – 1614) stand out. The latter is his most ambitious work in verse, an allegory that consists largely of reviews of contemporary poets. Compared to his ability as a novelist, Cervantes is generally considered a mediocre poet. The prose of the Galatea, which is in other respects so beautiful, is occasionally overloaded with epithet. Cervantes displays a totally different kind of poetic talent in the Viaje del Parnaso, an extended commentary on the Spanish authors of his time. Pedro de Urdemalas, a sensitive play about a picaro, who joins a group of Gypsies for love of a girl. El viejo celoso (The Jealous Old Man). These plays and entremeses made up Ocho Comedias y ocho entire messes nuevos, nunca representados (Eight Comedies and Eight New Interludes, Never Before Performed), which appeared in 1615. The dates and order of composition of Cervantes' entremeses are unknown. Faithful to the spirit of Lope de Rueda, Cervantes endowed them with novelistic elements, such as simplified plot, the type of descriptions normally associated with a novel, and character development. Cervantes included some of his dramas among the works he was most satisfied with. Scholars generally believe that he, above all, wanted to be a dramatist, to see his plays reach fruition. He thought that if only people with standing would view his works, they would see what he had to offer. The evidence is so strong for this that, "In all probability he would have given all the success of 'Don Quixote,' nay, would have seen every copy of 'Don Quixote' burned in the Plaza Mayor, for one such success as Lope de Vega was enjoying on an average once a week." His lack of care for Don Quixote when it was published further illustrates this desire for theatrical glory. The novel, initially uncelebrated by its author, was strung together and offered to its audience as a literary trifle whose object was merely to relieve boredom or act as a springboard towards other ideas, despite the profound legacy it would later develop. This play is a dramatization of the long and brutal siege of the Celtiberian town Numantia by the Roman forces of Scipio Africanus, completing the transformation of the Iberian peninsula to the Roman province Hispania (España). It is a story of local resistance against the foreign (Roman) invader, intended as a patriotic work. Cervantes invented, along with the subject of his piece, a peculiar style of tragic composition; he had no knowledge of Aristotle's now-famous lectures on tragedy. He wanted to produce a piece full of tragic situations, combined with the charm of the marvellous. To accomplish this, Cervantes relied heavily on allegory and on mythological elements. The tragedy is written in conformity with no rules, save those the author prescribed for himself, for he felt no inclination to imitate the Greek forms. He divides the play into four acts (jornadas) with no chorus. The dialogue is sometimes in tercets, and sometimes in redondillas, and for the most part in octaves – without any regard to rule. During his life, Cervantes was primarily known as a writer of comedy, which was how his contemporaries viewed Don Quixote Part I. His Novelas ejemplares were better received than Don Quixote and allowed him to publish his plays and entremeses, Viaje del Parnaso, Part II of Don Quixote, and (by his widow) Los trabajos de Persiles y Sigismunda. He then faded into semi-obscurity. Interest in him first revived in England in the 18th century, first by the deluxe edition of Tonson, for which the first biographical sketch was written (1738), and then by the scholarly editor John Bowle, who was the first to call Cervantes a "classic" author. This began his influence on other novelists and then an intense interest by the German romantics in the late 18th and early 19th centuries. The tricentennial, 1905, saw a great wave of celebrations in Spain. The year 2016, the 400th anniversary of Cervantes' death, saw the production of Cervantina, a celebration of the author's plays by the Compañía Nacional de Teatro Clásico in Madrid. Cervantes' novel Don Quixote has had a tremendous influence on the development of prose fiction. It has been translated into all major languages and has appeared in 700 editions. The first translation was in English, made by Thomas Shelton in 1608 (Part I only), but not published until 1612. Shelton renders some Spanish idioms into English so literally that they sound nonsensical when translated. As an example Shelton always translates the word dedos as fingers, not realizing that dedos can also mean inches. (In the original Spanish, for instance, a phrase such as una altura de quince dedos, which makes perfect sense in Spanish, would mean "fifteen inches high" in English, but a translator who renders it too literally would translate it as "fifteen fingers high". Carlos Fuentes raised the possibility that Cervantes and William Shakespeare were the same person, in the sense that Homer, Dante, Defoe, Dickens, Balzac, and Joyce are all the same writer whose spirit wanders through the centuries. Fuentes noted that "Cervantes leaves the page open where the reader knows himself read and the author written." Sigmund Freud was greatly influenced by El coloquio de los perros, which has been called the origin of psychoanalysis. In it, only one character tells his story; the other listens, occasionally making comments. At the center of the dog's story is a sexual event. Freud stated that he learned Spanish so as to read Cervantes in the original, and he signed 55 letters with the name of the character (dog) Cipión. The Biblioteca Virtual Miguel de Cervantes, the largest digital archive of Spanish-language historical and literary works in the world, is named after the author. 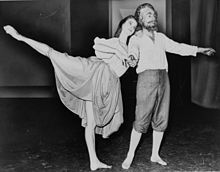 A 1965 production of Nicolas Nabokov's Don Quixote with choreography by George Balanchine. The 20th-century works of Jorge Luis Borges, Giannina Braschi, and James Joyce. Pablo Picasso painted a picture illustrating a scene from Don Quixote. In 1965, Salvador Dali created a Cervantes etching as part of the "Five Spanish Immortals' series (also included El Cid, El Greco, Velazquez, and Don Quixote). The theme of the novel also inspired the 19th-century French artists Honoré Daumier and Gustave Doré. Cervantes. A municipality in the province of Lugo, Galicia, Spain, but the name of the town is not based on Miguel de Cervantes (nor is there any evidence tying him or his family to this town). Cervantes. A municipality in the province of Ilocos Sur, Philippines. Cervantes. A township situated north of the Western Australian state capital Perth in Australia. The New Adventures of Huckleberry Finn. Episode 2 "Huck of La Mancha" features the live-action Tom Sawyer, Huckleberry Finn, and Becky Thatcher helping the animated Don Quixote and Sancho to challenge the brigand leader Don Jose (1968). Play of the Month. Season 8, Episode 5 "The Adventures of Don Quixote," with Rex Harrison in the title role (1973). The great watershed in modern Spanish intellectual history was the discovery in the 20th century, first by Spanish exile and Princeton professor Américo Castro, that many notable people including some Christian saints, were the descendents of Spanish Jews (Sephardim). 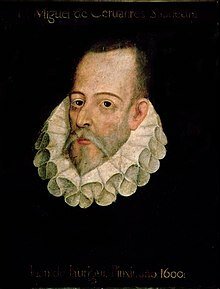 It has been estimated that 80% of the writers of Cervantes' day had Jewish ancestry. Modern scholars, especially in the United States, where Castro taught and had disciples, have suggested that his ancestors, before 1492, were Jews, and that he was therefore a New Christian or (the same thing) Converso, a group subject to much discrimination in the Spain of his day. This was the topic of a plenary address by Daniel Eisenberg to the Asociación de Cervantistas, in which he also suggests Don Quijote was thought of by Cervantes as a New Christian and Sancho an Old Christian. Others who have written endorsing this view are Rosa Rossi and Howard Mancing. Eisenberg suggests that Cervantes' mother was a New Christian as well. However, the theory rests almost exclusively on circumstantial evidence, but would explain some mysteries of Cervantes' life. Others such as Claudio Sánchez-Albornoz or Francisco Olmos Garcia (who considers it a "tired issue" and only supported by Américo Castro) strongly reject the theory. Bust of Cervantes erected in 1905, Burgos. Although the portrait of Cervantes attributed to Juan de Jáuregui is the one most associated with the author, there is no known portrait that is really a true likeness. The oil painting Retrato de un caballero desconocido (Portrait of an Unknown Gentleman), painted by El Greco in Toledo between 1600 and 1605, and on display at the Museo del Prado, has also been cited as a possible portrait of Cervantes, based on the fact that he was living near Toledo in 1604 and that he knew people within El Greco's circle of friends. The 1859 portrait by Luis de Madrazo, which the painter himself stated is based on his own imagination, is currently at the Biblioteca Nacional de España. The Spanish euro coins of €0.10, €0.20, and €0.50 bear an image of a bust of Cervantes. ^ The most reliable and accurate portrait of the writer is that provided by Cervantes himself in the prologue of the Exemplary Novels, complaining that the lost portrait by Juan Martínez de Jáuregui y Aguilar was not used as a frontispiece. This person whom you see here, with an oval visage, chestnut hair, smooth open forehead, lively eyes, a hooked but well-proportioned nose, and silvery beard that twenty years ago was golden, large moustaches, a small mouth, teeth not much to speak of, for he has but six, in bad condition and worse placed, no two of them corresponding to each other, a figure midway between the two extremes, neither tall nor short, a vivid complexion, rather fair than dark, somewhat stooped in the shoulders, and not very lightfooted: this, I say, is the author of Galatea, Don Quixote de la Mancha, The Journey to Parnassus, which he wrote in imitation of Cesare Caporali Perusino, and other works which are current among the public, and perhaps without the author's name. He is commonly called MIGUEL DE CERVANTES SAAVEDRA. ^ "He" refers to the writer of a spurious Part II of Don Quixote (Second Volume of the Ingenious Gentleman Don Quixote of La Mancha) known under the pseudonym Alonso Fernández de Avellaneda. Avellaneda had referred to Cervantes as an "old and one-handed" man. ^ The Spanish title of novelas is misleading. In modern Spanish it means novels, but Cervantes used it to mean the shorter Italian novella. See the Novel article for the terminological problem. ^ Cervantes Saavedra, Miguel de. "E-book of The Exemplary Novels of Cervantes". Translated by Walter K. Kelly. The Project Gutenberg. Retrieved 1 January 2007. ^ Chacón y Calvo, José María (1947–48). "Retratos de Cervantes". Anales de la Academia Nacional de Artes y Letras (in Spanish). 27: 5–17. ^ Ferrari, Enrique Lafuente (1948). La novela ejemplar de los retratos de Cervantes (in Spanish). Madrid. ^ a b Lienhard, John; Armstrong, Richard. "Time Out of Joint". Engines of Our Ingenuity. Retrieved 28 April 2018 – via UH.edu. ^ a b c M.A. Garcés, Cervantes in Algiers. ^ Slade, Carol (2004). "Introduction". Don Quixote. p. xxiv. ^ "Cervantes". Random House Webster's Unabridged Dictionary – via dictionary.reference.com. ^ Amadeu Àrias, Juli (22 April 2016). "El 'Quijote', tantas traducciones como locuras soñó su hidalgo". 20 Minutos (in Spanish). Retrieved 9 August 2018. ^ "Harold Bloom on Don Quixote, the first modern novel". The Guardian. London. 12 December 2003. Retrieved 18 July 2009. ^ "Don Quixote gets authors' votes". BBC News. 7 May 2002. Retrieved 3 January 2010. 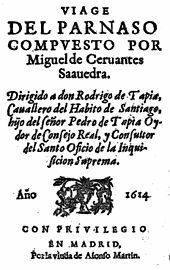 ^ "La lengua de Cervantes" (PDF) (in Spanish). Ministerio de la Presidencia de España. Archived from the original (PDF) on 3 October 2008. Retrieved 14 September 2008. ^ "La Epístola a Mateo Vázquez: historia de una polémica literaria en torno a Cervantes". Centro de Estudios Cervantinos. Archived from the original on 3 February 2012. Retrieved 3 February 2012. ^ "Domingo, nueve días del mes de octubre año del señor de mil e quinientos e cuarenta e siete años, fue baptizado Miguel, hijo de Rodrigo de Cervantes e su mujer doña Leonor, fueron sus conpadres Juan Pardo. Baptizole el reverendo señor bachiller Serrano cura de Nuestra Señora, testigos Baltasar Vázquez, sacristán e yo que lo bapticé y firmé de mi nombre. Bachiller Serrano". (in Spanish). City Council of Alcalá de Henares. Retrieved 27 June 2013. ^ "Miguel de Cervantes". geni_family_tree. Retrieved 5 December 2016. ^ Byron, William. Cervantes: A Biography, Doubleday & Company: Garden City, NY, 1978, pp. 23–32. ^ "Cervantes y el Colegio Imperial". ^ Diego, Héctor Vielva. "Was Cervantes Ever in Istanbul?". We Love Istanbul. We Love Istanbul. ^ López Alonso, Antonio (1999). Enfermedad y muerte de Cervantes. Universidad de Alcalá de Henares. p. 112. ^ a b c d e f g h i j One or more of the preceding sentences incorporates text from a publication now in the public domain: Herbermann, Charles, ed. (1913). "Miguel de Cervantes Saavedra" . Catholic Encyclopedia. New York: Robert Appleton. ^ Miguel, de Cervantes (2015). The Ingenious Gentleman Don Quixote of La Mancha. Aegitas. ISBN 978-5-00064-159-0. ^ Miguel de Cervantes – Barbara Keevil Parker, Duane F. Parker. Books.google.co.uk. Retrieved 18 March 2014. ^ C. Calvo, Shakespeare and Cervantes in 1916, 78. ^ Eisenberg, Daniel (Fall 2014). "Un médico examina a Cervantes" (PDF). Cervantes: Bulletin of the Cervantes Society of America. Archived (PDF) from the original on 3 March 2006. Retrieved 17 March 2015. ^ "Miguel de Cervantes Biography – life, family, children, name, story, death, history, wife, son, book". Notablebiographies.com. Retrieved 3 February 2012. ^ Giles Tremlett in Madrid. "Madrid begins search for bones of Don Quixote author Miguel de Cervantes | Books". The Guardian. Retrieved 18 March 2014. ^ "Casket find could lead to remains of Don Quixote author Miguel de Cervantes | Books". The Guardian. Agence France-Presse. Retrieved 17 March 2015. ^ Frayer, Lauren (24 June 2015). "The Reason Cervantes Asked To Be Buried Under A Convent". NPR. ^ "Spain finds Don Quixote writer Cervantes' tomb in Madrid". BBC. Retrieved 17 March 2015. ^ "Remains of Cervantes, author of Don Quixote, 'identified in convent'". The Guardian. Agence France-Presse. 17 March 2015. Retrieved 17 March 2015. ^ Giles, Ciaran (11 June 2015). "Spain formally buries Cervantes, 400 years later". Associated Press. Retrieved 11 June 2015. ^ David A. Boruchoff, "On the Place of Madness, Deviance, and Eccentricity in Don Quijote," Hispanic Review 70.1 (2002): 1–23; quotations on 2–3. ^ Boruchoff, David A. (2009). "Free Will, the Picaresque, and the Exemplarity of Cervantes's Novelas ejemplares". Modern Language Notes. 124 (2): 372–403. ^ Sacchetti, Maria Alberta (2001). Cervantes' Los trabajos de Persiles y Sigismunda: A Study of Genre. Tamesis Books. p. 207. doi:10.2307/1261878. ISBN 978-1-85566-077-9. OCLC 52263865. ^ "Comedia Famosa Del Gallardo Español". ^ "Ocho comedias y ocho entremeses / El rufian dichoso". ^ "Entremes: El Juez de los Divorcios". ^ "El Rufián Viudo Llamado Trampagos". ^ "Entremes: El Vizcaíno Fingido". ^ "Entremes: El Retablo de las Maravillas". ^ "Entremes: El Viejo Celoso". ^ "Ocho comedias y ocho entremeses". ^ a b "Proyecto Cervantes". cervantes.tamu.edu. Retrieved 16 November 2015. ^ "The second edition of Thomas Shelton's Don Quixote, Part I: A reassessment of the dating problem, by A.G. Lo Ré". Web.archive.org. Archived from the original on 1 July 2010. Retrieved 17 March 2015. ^ Shakespeare Studies. Books.google.co.uk. Retrieved 19 March 2014. ^ Kossoff, A. David (1979). "Fuentes de "El perro del hortelano" y una teoría de la España del Siglo de Oro". Estudios sobre literatura y arte dedicados al profesor Emilio Orozco Díaz. Granada:. 2. Universidad de Granada, Spain. pp. 209–213. ^ Eisenberg, Daniel (2008). La actitud de Cervantes hacia sus antepasados judaicos. Cervantes y las religiones. Actas Del Coloquio Internacional de la Asociación de Cervantistas. pp. 55–78. ISBN 978-84-8489-314-1. ^ The Cervantes Encyclopedia. Westport, Connecticut: Greenwood, 2004 (2 vols). ^ Byron, William (1978). Cervantes: A Biography. Doubleday. p. 32. ISBN 978-0-385-00279-0. ^ Byron, William (1978). Cervantes. A Biography. London: Cassell. p. 131. ISBN 978-1-55778-006-5. ^ Rojas Martínez, Ángel (ed.). Cervantes. Una identidad sin rostro (PDF) (in Spanish). University of Castilla–La Mancha. pp. 169–178. Retrieved 25 June 2013. ^ "Portrait of a Gentleman". Museo del Prado (in Spanish). Ministerio de Cultura y Deporte, Gobierno de España. Retrieved 25 June 2013. ^ "Programa Europa – Cervantes". Fábrica Nacional de Moneda y Timbre (in Spanish). Real Casa de la Moneda. 2013. Archived from the original on 29 June 2013. Retrieved 25 June 2013. ^ "Euro notes and coins: national sides". European Commission. 8 January 2010. Archived from the original on 7 February 2010. Retrieved 25 June 2013. Cervantes: A Collection of Critical Essays, ed. Lowry Nelson, 1969. Cinco personajes fugaces en el camino de Don Quijote, Giannina Braschi; Cuadernos hispanoamericanos, ISSN 0011-250X, Nº 328, 1977, pp. 101–115. Critical Essays on Cervantes / ed. Ruth S. El Saffar, 1986. Scenes from World Literature and Portraits of Greatest Authors, Manuel Vázquez Montalbán and Willi Glasauer, Círculo de Lectores, 1988. Cervantes's Don Quixote (Modern Critical Interpretations), ed. Harold Bloom, 2001. Cervantes in Algiers: A Captive's Tale, Maria Antonia Garcés, Vanderbilt University Press, 2002. The Cambridge Companion to Cervantes, ed. Anthony J. Cascardi, 2002. Miguel de Cervantes (Modern Critical Views), ed. Harold Bloom, 2005. Cervantes' Don Quixote: A Casebook, ed. Roberto González Echevarría, 2005. Le Barbaresque, Olivier Weber, Flammarion, 2011. Pérez, Rolando. "What is Don Quijote/Don Quixote And…And…And the Disjunctive Synthesis of Cervantes and Kathy Acker." Cervantes ilimitado: cuatrocientos años del Quijote. Ed. Nuria Morgado. ALDEEU, 2016. 75–100. Wikisource has the text of the 1911 Encyclopædia Britannica article Cervantes Saavedra, Miguel de. This page was last edited on 23 April 2019, at 18:13 (UTC).